Obviously, I was so happy to know that the young girl is mature enough to be so helpful. This then became the inspiration to plan my Hadith studies class for this evening. I wanted to teach the kids this Hadith but make it real. Make it more relevant and memorable for them. The boys always ask what will help them gain extra reward on the Day of Accounting – so I wanted them to come up with things they could do, but in relation to this Hadith. I took in a few items from home, they picked what they wanted to use. I asked them to write a story about themselves and a neighbour – a story about them being generous using the item they’ve picked. I modelled the task for them by using an application form and a pen and said I helped an elderly neighbour fill out some forms. I then left the boys to their imagination and Alhamdhulillah I got some brilliant stories. This task also taught me as a teacher, who in my class are the budding writers. • Shopping bag – help neighbour with shopping. • wooden spoon and spatula – bake a cake for neighbour’s son. • spanner and Alan key – help neighbour who recently moved in, fix his table. • telephone – call 999 to report distressed neighbour’s stolen car. • smiley face – smiling is charity and we smile at even the nasty neighbour. For obvious reasons it’s important to teach our children Hadiths – but make it real and watch them appreciate it. I now have a boy who is determined to offer to go and buy his neighbour’s shopping. And I’m pretty sure there will be a massive spread of happy smiles in my city because they now know that it is sadaqah to smile. Kids happy, teacher happy and InshaAllah the beginning of little people turning into caring and loving neighbours. 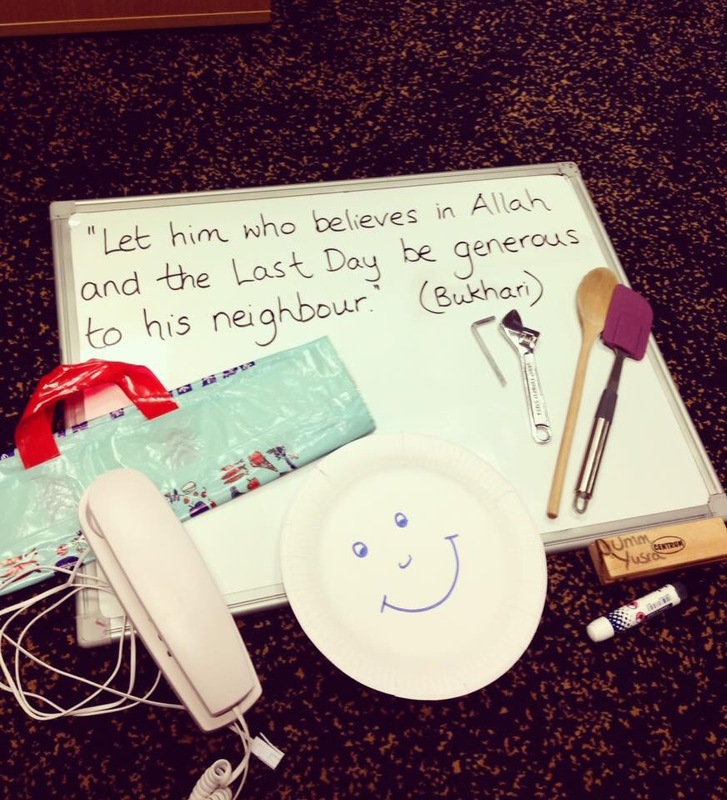 Alhamdhulillah for the blessings and teachings of Islam – we would be at a loss without it. I really love finding ways moms are taking the Quran and Hadith and going beyond just simple memorization but actual application. I will definitely save this post for when my kids are older. ماشاءالله. Baarak Allah feekum.